A chaperone service for people with mental health problems needing moral/emotional support to attend DWP appointments, assessments, etc. I’m wearing two hats as I write this post. Firstly, as a Wellpool blogger and team member. And secondly, as Activity Coordinator for Kindred Minds. I learned yesterday that Advocacy Works is no more. When I was in receipt of benefits myself, they were invaluable in attending assessments with me. They are one of the latest victims of the throttling of funding for support for claimants and people with mental illness. One of my first jobs in my role as Kindred Minds’ Activity Coordinator was to complete the set-up of our Buddy Scheme to provide chaperones in these situations. With the fall of Advocacy Works, and the rolling out city-wide of Universal Credit over the next month or two, we at Kindred Minds believe that this service is going to be in great demand. So we are looking for more volunteers for the Buddy Scheme. We need to make clear that we can only provide chaperones for appointments. We can’t speak for, advise or otherwise represent service users. Whilst some of our volunteers have experience and expertise in the field of mental health and wellbeing support, the majority of our volunteers will not. What we look for in our volunteers is a sensitivity and empathy towards the issues of mental illness, and the stress that appointments, assessments, judgements etc. put claimants under. It is ideal for (but not limited to) students, for example, studying psychology or any aspect of mental health care. The volunteer role will ask for availability for a maxiumum of two appointments/accompaniments in a month, and travel expenses will be paid. If a volunteer is out for longer than 3 1/2 hours, it’s also possible to claim for an inexpensive meal (you know those meal deals that most supermarkets offer now). We are insured to cover our volunteers, we also need a DBS check, which we pay for. If you go to MPAC in the town centre, we have an account with them. I can provide a note confirming that you are volunteering for us, and they will simply invoice Kindred Minds. Every two weeks, we will ask you to either fill out a form, or let me know so I can fill it, when you are available for the following two weeks. We have learned as we have piloted the scheme that people tend to contact us and ask for our help with very little notice. So by having everybody’s availability at our fingertips, we can aim to provide cover for the appointments. We can not accompany to hospital appointments currently, and we can not do home visits, unfortunately (some claimants have home visits from DWP representatives, but our insurance won’t cover us to attend these). 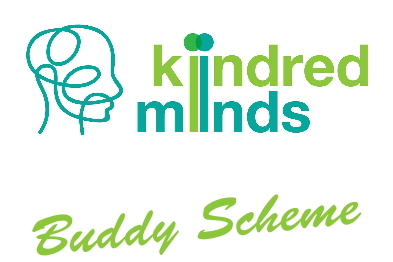 Please get in touch through Kindred Minds Email: kindredmindsliverpool@gmail.com with a subject line such as Buddy Scheme – Volunteering. Or phone us on: 07379-892793 (phone is on from 9-5 weekdays, but you can leave a message and I’ll get back to you ASAP). I will be happy to answer any questions, and arrange an induction with you to go through paperwork and give full information.